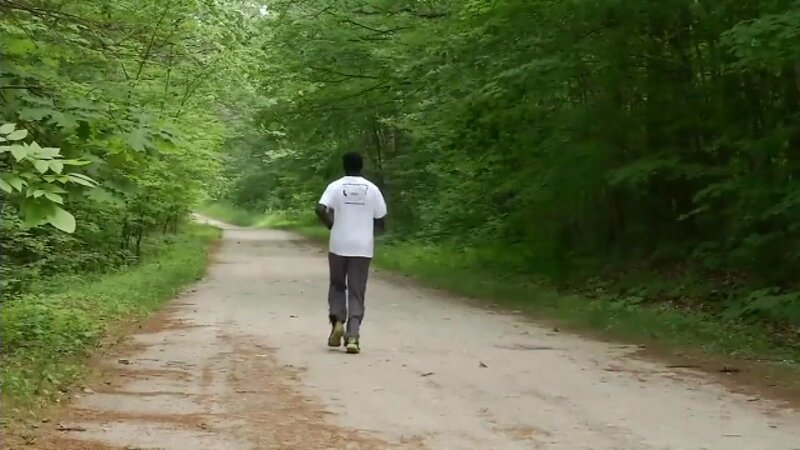 AUBURN, Maine -- A professional runner from Kenya who was out training on a nature trail in the woods near his home in Maine says he encountered two charging black bears but was able to outrun them during a frantic sprint to a nearby vacant house for cover. Moninda Marube said when he saw the bears early Wednesday his instincts kicked in and he did what he does best: run. He told the Sun Journal that the bears were 20 yards (18 meters) away from him and a vacant house was 20 yards away in the opposite direction. So he made a run for the house, with the bears closing to within 10 yards (9 meters) by the time he found safety on the house's screened porch. The bears stopped, not realizing they could've easily crashed through the flimsy porch screens, Marube said. They sniffed around for a while before wandering away. Wardens advise people who encounter black bears to make themselves appear big, make noise and back away slowly. But they recommend people stand their ground if a black bear charges and say if the bear attacks, then fight back. But Marube said that's easier said than done. He said he knew that black bears can climb trees, so he couldn't climb to safety. He said he considered jumping in a nearby lake, but he can't swim. He said he initially engaged in a stare-down with the bears but the bears charged the moment he turned his back on them. Marube, a student at the University of Maine at Farmington who finished third in the 2012 Maine Marathon and won the 2013 half-marathon, said he'd once encountered a leopard perched in a tree while alone in Africa - but the bears were scarier. He said he learned an important lesson from his close encounter with Maine's wildlife: "Just make peace with people. You never know when your day comes."